It turned out to be a great morning for a race. Saturday morning was cool for July in Texas. It was partly cloudy and just a bit humid. 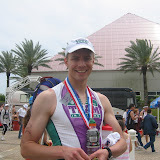 During the pre-race morning meeting, I spotted a younger fraternity brother I know from reunion weekends, providing another testament to the growing popularity of triathlon. TriWaco was to be his first race. After the IronHead Race Productions's Jack Weiss barked out all of the need to know information about the rules and the course, I joined the first wave of swimmers, those of us wearing pink swim caps. It was crowded as we all made our way down to the river and the swim entrance carpeted with AstroTurf. 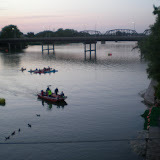 Again, lots of people are into this sport and like most, TriWaco was sold out. The Sprinters went first followed by the Olympic distance competitors. After about 10 minutes past the gun sounding, I came out of the other side of the swim course, just a bit farther down the shoreline than where we began. Jogging up the ramp toward street-level, I felt pretty good about my swim. I was hardly fast but my race plan was to go easy and not overexert myself on the swim. I would need that energy for the bike and run where I could make it count most. My heart rate always shoots up the last 100 meters of the swim as I hurry to get to shore and then start my jog to transition and today was no different. The bike course at TriWaco is a straight out-and-back down a state highway-type two-land road with a wide shoulder. Police held back traffic at the few major intersections. My wave began the steady procession of cyclists that would hog the road for the next couple of hours. Sorry Waco drivers! With new tires, a new seat position and height adjustment from the evening prior, I really was testing this new bike configuration for the first time. That's not generally a good idea but it went well. See you next year Waco! After a spill on his bike a week ago on what was to be a nice long training ride for us both, Mike W sustained enough nasty scrapes and deep gashes that he's been forced to miss TriWaco for a second straight year. This one hurts, because unlike me, Mike is otherwise ready to kill this course. Dusty with family, both parents and wife/kids in tow, is back this year too. 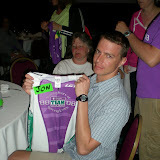 He's part of triathlon club in Austin, so I'm predicting a great showing for him tomorrow. The upside for me with Mike idle, is that he's given me some constructive attention. We made a few bike adjustments that I really think will help me tomorrow. I had the eggplant parmesan after several helpings of salad and breadsticks at the Olive Garden. Mike got the chicken variety. Our tradition of OG carbo-loading complete, it's now time to wind down.